Home to the sixth-best beer city in the country, the Bay Area is naturally teeming with world-class brewers, from old-guard guys like Anchor’s Mark Carpenter, to new-guard dudes like Almanac’s Jesse Friedman. And while today they’re making some of the best beers in the state/country/continent, there was a time when they, well, weren’t. In their own words, here’s how the first beer-brewing experience went for eight of the Bay Area’s most renowned brewmasters, the results of which included many boil-overs; angry parents, girlfriends, and roommates; and not one but two beers with cinnamon as a prominent ingredient. 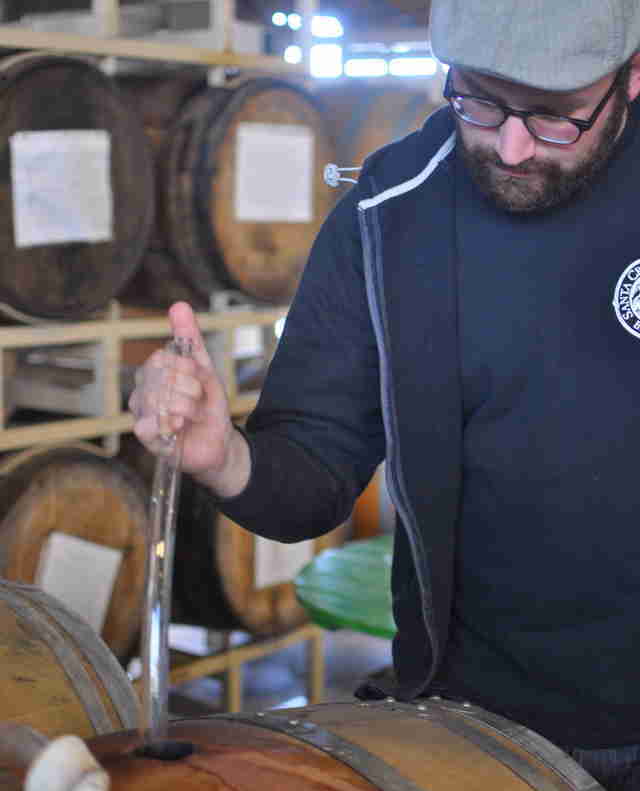 “I brewed my first beer at age 16 during the summer of my sophomore year in high school. It seemed like the easiest way to get beer. 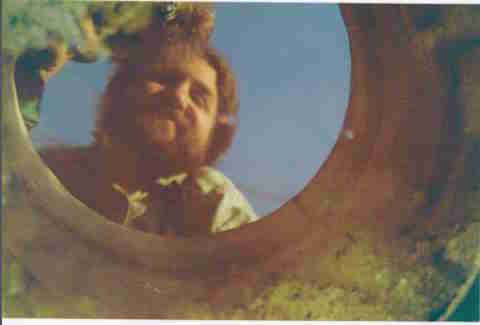 I was living in Lafayette at the time, and I found Oak Barrel Winecraft in Berkeley in the Yellow Pages under ‘brewing supplies.’ I took my best friend Brian and my parents' Ford station wagon. We showed up just before closing time -- typical Friday afternoon traffic -- and tried to act cool. “Oak Barrel legend Homer Smith was behind the counter. He was very friendly and advised me to purchase a starter package along with an American Ale extract kit. I plunked down close to $100 (lifeguarding money) and Brian and I loaded the car with large brown bags full of magical syrup, pellets, and powder. We decided to brew at my parents' house the following Friday. “Both of my parents worked, so we figured we could boil it up and transfer to the glass carboy before either of them arrived home. Unfortunately, our plan was foiled. The beer took ages to boil -- then boiled over. My mom came home just as we were adding the aroma hops. Once they splashed the surface of the boil, they unleashed a pungent aroma that I was sure could be smelled throughout our whole suburban block. My mother forgave me for using her 5-gallon pot, helped us clean up the boil over, and promised not to tell my dad. 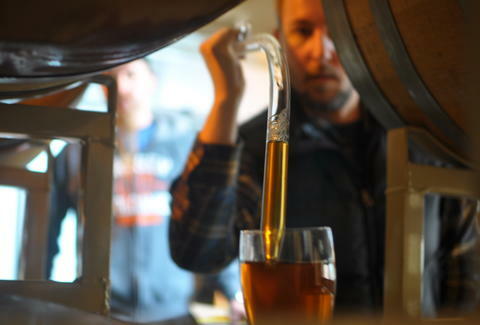 “We hid the carboy in our garage, tucked behind several blankets on an old workbench. My father wasn't very handy; he never found it. On the day we bottled the American Ale, however, we brewed a Russian red ale recipe from Oak Barrel and left it in the same place. A week into fermentation my father happened upon the glass carboy. In a rage, he picked up a baseball bat and threatened to smash it to pieces. “‘Wait!’ I pleaded. ‘Here's our first batch -- try it.’ He loved it, and agreed to look the other way as long as he had access to the fruits of our labor. We considered it a fatherly excise tax. 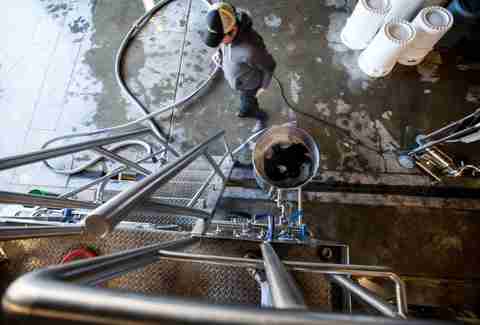 “Almost all the brewers today, the younger guys, they started out as homebrewers. I didn’t. I started with Anchor in 1971; I think homebrewing had only been recently made legal. There weren’t the homebrewing shops or backup for it at the time. “I’d grown up loving beer and loving breweries. My very first brew was virtually the day I was hired at Anchor. We started brewing at 4 in the morning. It was really quite something to be involved in it. We had a combination mash tun/lauter tun. Most breweries start out with the mash in one vessel that separates out the sugar and then another vessel that separates all the liquid. We just had a crude one. “We started at 120 [degrees] and worked our way up to 160. To change the temperature, we worked with live steam injected into the mash. When you turned on the steam injection it sounded just like a giant espresso maker. “It just rattled, like when you’re steaming your milk, but multiply it by a couple hundred. “[Anchor] was a dimply lit old building with an old brewhouse. I was just in heaven that day. We went through the whole brewing process. It took about 12 hours to get it into a fermenter, and then you went home. “The first time I ever homebrewed was during a visit home from college. My father was excited that his two sons, my older brother and I, were both interested in beer and pulled out his old homebrewing equipment. He had stopped homebrewing a decade earlier when his brewing buddy moved away and life moved on. “The equipment consisted of a few 5-gallon buckets, one with holes drilled in the bottom for a mash tun, a large soup pot, a big metal spoon, a funnel, a few mesh bags, and some tubing. “Together the three of us, using a primarily extract recipe, made a terrible mess of the kitchen and produced ‘Frothingslosh,’ an old stout recipe of my father’s. We got pleasantly buzzed drinking many beers during the process. “The first brew I ever made was actually quite boring. It was basically a light cream ale about 3% ABV and 20 IBU using dried malt extract. I added cinnamon, but it didn’t come through, which actually was a good thing. “I estimate I was 18 or 19 years old, and brewed it under the guidance of my college calculus teacher on my mother’s stove with the typical 5-gallon kettle and carboy and immersion wort chiller. My mom would buzz around with an eye of concern. Luckily, this was well before the dawn of Breaking Bad on television. “I remember being very impressed that not only was it drinkable, but it wasn’t actually equal to some store brands. It was a bit lighter than what I intended, however it taught me basic concepts, such as less can be more. Every batch I brewed after this one had three to four times the malt and were boozy hop bombs in comparison. “Did I mess anything up? Not really, other than not meaning to make a 3% beer; extract efficiency and grain bills were a complete mystery. I recall being completely amazed that I could ‘chuck anything in that I wanted,’ which was the advice of my calculus teacher; he could’ve said to be careful and conservative but he didn’t. This inspired that air of creativity that enamored me with brewing and burned inside me until I figured out how to make a real job out of it. “The first beer I brewed was an American red ale in 1991. I was 22 and had just landed in SF after college. I had spent the preceding couple of years discovering craft beer and visiting breweries, becoming obsessed enough to seek out the local homebrew shop (on Taraval, since closed) as soon as I found a place to live. 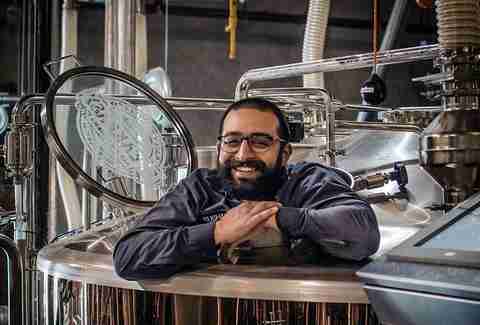 “I asked them what I should do to make something like a hoppy red/pale ale and they set me up with the ingredients and the most rudimentary of gear (along with Charlie Papazian's Joy of Homebrewing, the bible at the time). I had a boil-over that took forever to clean off the old Wedgewood stove top, much to the chagrin of my girlfriend. Then later in the process, I had some bottles explode in my closet because I used too much priming sugar. “The beer itself was surprisingly okay -- definitely drinkable. The fermentation was a little slow to start and sluggish and I had zero temperature control so it ran a little warmer than it should have. Neither of those things did wonders for the final flavor profile, but I had been given plenty of dire warnings about cleanliness and sanitation so at least there were no contamination off-flavors. The beer was over-carbonated in a slightly unpleasant way, but I yielded about a case and a half of unbroken bottles that I drank with great enthusiasm and pride. 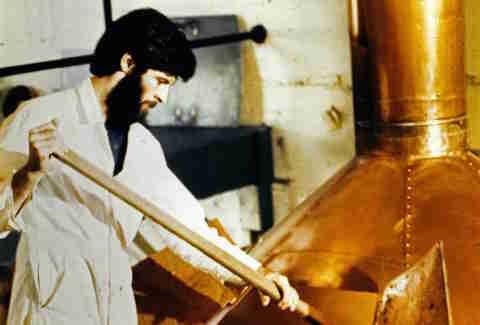 “I was supposed to brew my first beer when I was around 21 years old. My girlfriend at the time bought me a homebrew kit from More Beer for my birthday -- the simple kind with the plastic buckets and an IPA recipe. For whatever reason I never did it and have been living with this incredible guilt ever since. This has led me to move this homebrew kit around with me for the past nine years from apartment to apartment. It would probably make a pretty bad beer at this point. 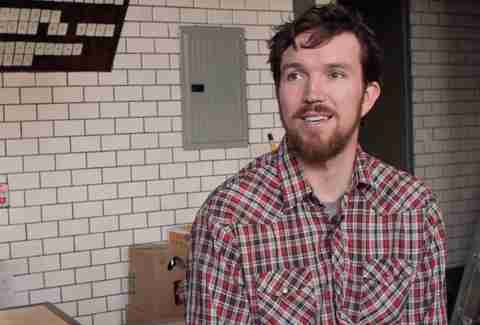 “Apart from watching a few people homebrew, the first beer I actually brewed was with my roommate in 2010, I think. We went to Brewcraft and asked for something easy. We ended up making a pretty simple American pale ale. It turned out fine I suppose. I remember he was very stoked that we were able to just make decent-tasting beer. This was a partial extract recipe. I remember insisting on glass carboys for fermentation -- they seemed much more proper than plastic buckets. 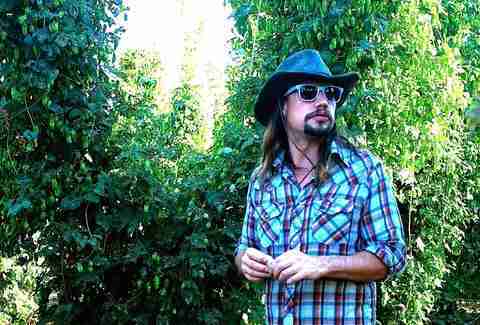 “After that I didn't homebrew again until I was working at Mill Valley Beerworks. They sponsored a staff homebrew competition and the prize was the chance to brew your beer at Beerworks on the three bbl system. I went back to Brewcraft, now determined to use my own pseudo-beer expertise to create my own recipe. I described what I wanted -- some kind of red beer with rye to which I would add apple cider, brown sugar, and cinnamon. It would be complex and really capture the flavor of fall! I remember Griz yelling something at me about all those adjuncts but I insisted on staying the course. Anyway, I brewed the beer at home without any real problems. Had a pretty messy time bottling. My auto siphon broke so I was just running a plastic hose from the carboy up on a table down to the floor and filling the bottles with that. “The competition was getting closer and there was only one other person entering, this girl Molly. She was making some sort of stout with dates that was called ‘Date Night.’ At this point I thought things were very grim because I didn't even have a name for my beer and Date Night really sounds like a winner. 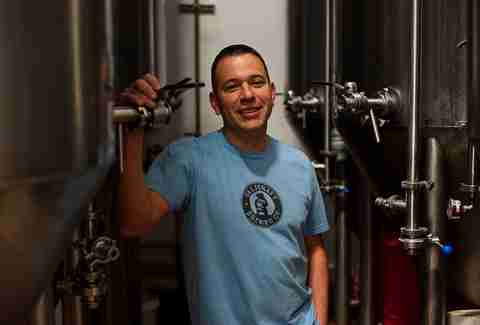 “I brewed my first batch of beer in my dorm at UC Berkeley in 1997. It ended up being the first Buzzerkeley. I brewed it in the center commons and made a deal with the clean-up crew that if they let me brew, I would give them beer (amazing, the bargaining power of beer). “I was on a mission to figure this out and through a LexisNexis search (whew, showing my age) found out that Champagne yeast would help finish the beer. I was off to the Oak Barrel homebrew store in Berkeley! “The first batch of homebrew I ever brewed was an Irish red ale. It was just after I moved to San Francisco. My roommate and I picked up the kit at Brewcraft and were yelled at by Griz (an important rite of passage for any SF homebrewer). Anna Roth is a San Francisco freelance writer and she’s really glad Jim’s dad didn’t smash the glass carboy with a baseball bat. Follow her on Twitter at @annaroth.